Today lap counting, tomorrow underwater PSP!! Swimming bores the crap out of me, though for some reason I do it. So anything that makes the endless laps somewhat less catotonic sounds great to me! 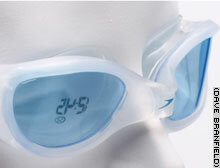 A student in Scotland designed these goggles that give a head's up display of the number of laps (and, judging by the pic, the time of day or lap time). They count the laps by detecting a change in the direction of an internatl compass. If you can't grow gills, wear them!!! An Isreali inventor has submitted patent applications for a breathing apparatus that works without oxygen tanks. I don't presume to know much about chemistry, marine biology, physics, or any other science, but I know my way around breating, and it seems this thing works the same way that fish gills do. Could this be a temporary fix to human over-population?